Salmon means luxury to me, a hangover from before Tasmania’s farmed Atlantic salmon industry, when all the salmon you could buy in Australia was canned, smoked or air freighted at enormous cost. Top quality salmon is now readily available here and still it comes at a cost, to the pristine southern marine enviroment. I’ve reduced the amount and frequency I serve salmon, but I can’t resist totally. It’s such a versatile fish, hot smoked, cold smoked, cured, poached, pan fried, sashimi, I love it all. I’ve found a small portion goes along way if it’s flaked into bite sized pieces and added to a salad, in fact less than 200g makes a satisfying meal for two hungry eaters. The other thing I love about salmon is that it has so any soul mates, flavours that are complementary to one another, as well as the salmon itself, so it seems right to put them all on a plate together then bring them together with deliciously lemon salad cream, an old style dressing recipe which deserves to be dusted off and given a new lease of life. The quantities below make a beautiful meal for two. To make the dressing, whisk all the ingredients together in a small bowl until smooth. Season to taste and set aside. Scrub the potatoes, slice thickly then steam until cooked. Tip the potatoes into a bowl and dress with 1 tablespoon of the lemon cream. Set aside to cool. Blanch the asparagus, or steam the beans for 6 minutes then refresh in iced water. Pick the herbs, then wash and dry them with the rocket. Remove the skin from the salmon fillets, then it break into bite sized pieces. to serve: Arrange the potatoes on two plates, top with asparagus or beans, leaves, capers and salmon. Drizzle the lemon cream over the plated salads and garnish with lemon zest . this looks perfect for summer and the festive season. I love hot smoked salmon- you already know this- and the salad cream is a nice touch. Might check out the Tassal shop in Kew and see what they have….. Absolutely delicious Sandra! Another beautiful salad that needs to grace our table around Christmas time – thanks for the inspiration. Thanks Margot, it’s a delicious salad. The dressing goes with any seafood, fish, even chicken..
We are quite fortunate to have salmon in great supply but you still have to do your homework lest you support one of the less green suppliers. Your salad is a great use of this truly tasty fish. I love the suggestion of grilling the fish beforehand. Yum! This salad look so pretty and delicious! Fab salad Mrs R. I feel your conundrum but also partake, although less often these days. I also believe that the Tassie salmon farmers are giving it a red hot go, so want to be supportive too. I am sorry that it is so difficult for you to find the fresh wild salmon, I feel very fortunate here on the West coast. When it isn’t in season we just don’t eat it 😦 Farmed fish is full of antibiotics and other things that are bad for you. Australia has no native salmon Liz. The english introduced trout to our river system, and we have ocean trout, but the only salmon available is farmed or imported. The Tasmanian Atlantic Salmon industry is working hard to minimize their enviromental impacts, but it’s early days…. I’m always looking for something fresh to tempt my mum. This is lovely. An absolutely beautiful salad, Sandra . . . Yes, I have and do use both Huon and Tassal, but have to admit to reservations regarding the farmed fish! The aquareovirus facts, usage of antibiotics and fish food not normal for their species, artificial colouring etc do make one go back to university generated facts [have used both Uni of Tasmania and Uni of Oslo, Norway writings] in addition to only having half the omega oils found in Alaskan free caught fish make me love the taste but strongly restrict my usage . . . I know the Tassie salmon industry is working on cleaning up it’s act so they probably need encouragement…. I could not agree more! And already in 2009 it was a 350 million dollar industry for the island. Just some of the problems are not that easy or cheap to fix. Hope we are doing better than Norway [surely one of the most honest countries in the world] where it is suggested pregnant women, children and young adults do not partake . . . * smile* Well, whilst Matthew Evans lives on the island . . . and ABC has serious panel shows . . . and all this does not mean I won’t make your inviting salad before Yule!! We certainly have plenty of salmon here but I find the West coast salmon to be even better. Salmon on salad is a great way make it go further and this looks delicious. Sounds wonderful Sandra. My husband grills salmon on the bbq to perfection and I can just imagine it in this salad. The dressing sounds amazing. Thanks Ardys, a man who can cook salmon to perfection is worth his weight in gold! Hang on to him…..
You are so right Sandra!! 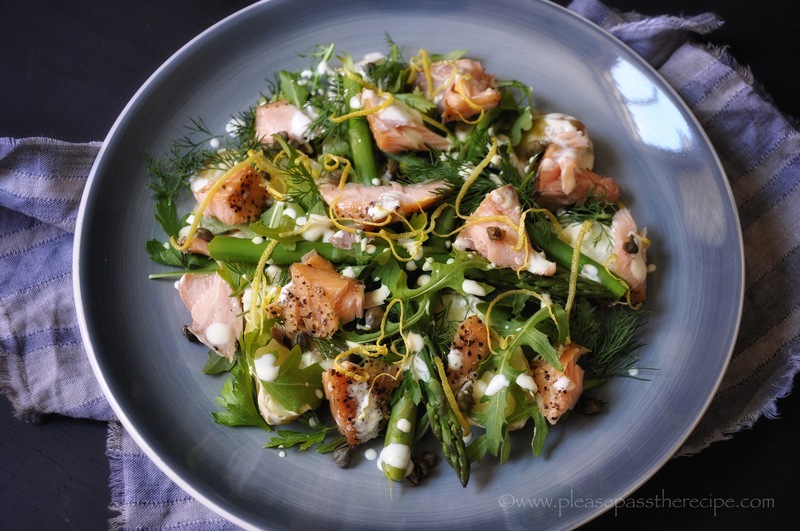 This entry was posted on December 10, 2015 by ladyredspecs in FODMAP diet, Food, Gluten Free, Light Savoury Dishes, Main Meals, Salad, Seafood Dishes and tagged asparagus, capers, dill, FODMAP diet, hot smoked salmon, lemon, lemon salad cream, parsley, potatoes, rocket.